American made furniture at its finest! 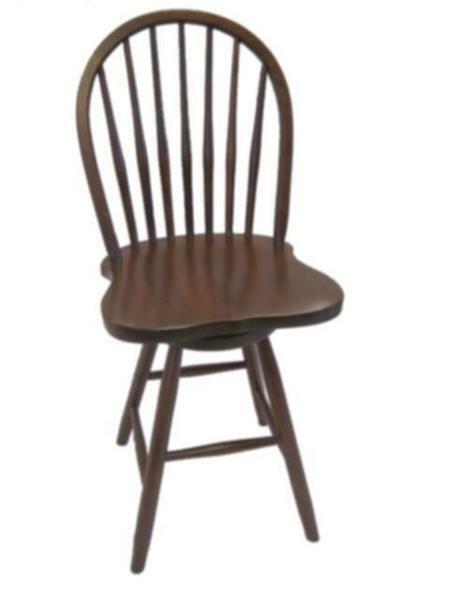 Our Amish 7-Spindle Swivel Barstool comes straight from the heart of Amish country in Ohio. Made to order for your home, you will fall in love with this traditional style that is complete with the convenience of a swivel. Whether you choose to make use of your new barstool at the kitchen counter or at your bar, you are sure to find many uses for our solid wood furniture. Available to customize in oak, cherry, hard maple, brown maple, hickory, or walnut. Choose from these beautiful options that are handpicked and sourced from America. This barstool is available as standard in a 24" seat height and can also be ordered in 30" to accommodate your space. Feel free to give us a call at 866-272-6773 to discuss all of your options for this American made piece.